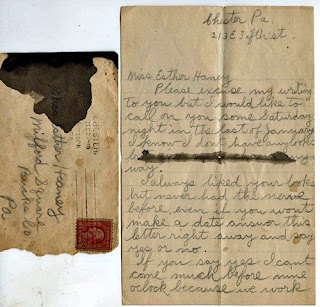 I was looking for an old valentine and came across this letter. The envelope is dated Dec 27-10. Please excuse my writing to you but I would like to call on you some Saturday night in the last of January. I know I don't have any looks but give me a chance anyway. I always liked your looks but never had the nerve before. Even if you won't make a date answer this letter right away and say yes or no. If you say yes I can't come much before nine o'clock because we work up until 4 o'clock on Sat. I don't know if you have any fellow or not but I don't think you have for you had none last summer.